As you should know already, the WebM project is dedicated to developing a high-quality, open video format for the web that is freely available to everyone. Latest Open Shot 1.2.2 now has an option to export your videos in WebM format. 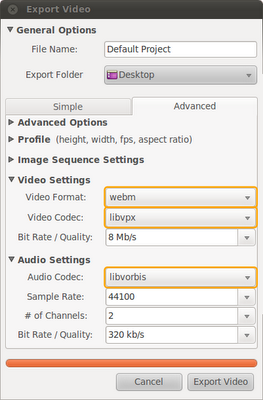 The WebM format is a combination of a new video codec sponsored by Google called "VP8" and the "Vorbis" audio codec. The container format ends with a ".webm" extension. As the developer points out, OpenShot does not have a "Simple" profile for WebM yet, you can still use it, if you know how.